A warranty is a written guarantee, given to the customer from a vendor, promising to fix or replace an item if it is damaged in a specific time period. The type of damages covered may be specific to the warranty. The vendor who issued the warranty needs to be contacted directly for a warranty claim and they will decide the next steps (to fix or replace the item). If you are processing a warranty for a Trek product, there's a specific process for those items. Learn about it here. However, there are a few steps you can take to keep Ascend up-to-date during the warranty claim process. Allow Commands in SQL Query Window: Run the Warranty Items report to view the status of a warranty. Inventory Adjustments - Add: Create an inventory adjustment to remove warranty returns from stock. 1. Create a Return in Ascend. 2. You can either add the product(s) by scanning the receipt and checking the item after selecting Return, or by scanning/searching for the item in the transaction screen. 3. Verify the item(s) has a negative quantity. 4. 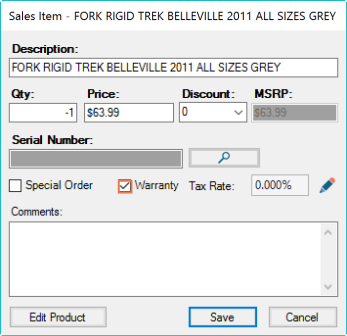 Double-click the item to edit it. 5. Check the Warranty box. Sherpa tip: Because the item is a return, its quantity is added back into your inventory (regardless of warranty status). If a manager determines the item cannot be repaired or resold, create an inventory adjustment to remove it. 7. The Warranty Item window opens. 8. Update the status if needed. 9. Enter any details of the warranty and the damage to the item. 1. Select View > Customers from the Ascend desktop. 2. Find and highlight the customer. 3. In the lower part of the window, select the History tab. 4. Expand the Completed Transactions folder. 5. Double-click the transaction where the item was originally sold. 6. Print a physical receipt. a. Make sure the Print icon is active. b. Select Save in the transaction. 7. 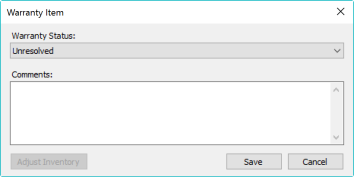 Or save the receipt as a file. a. Select File > Print Preview. b. 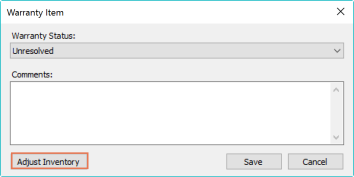 Select the Save icon. c. Choose where you'd like to save it, update the filename if needed, and select Save. d. You can also select the Email icon to send a copy to the customer. 2. Find the Warranty folder on the left and expand it. 3. Double-click the Warranty Items report. 4. Fill out the Filters window. a. Select the Status you are investigating in from the drop-down menu. b. 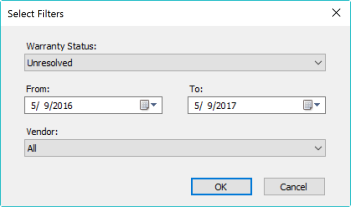 Indicate the Date Range you are searching for. c. Specify a Vendor, if needed. 7. Double-click on an item to edit the Warranty Item window. 8. If needed, update the Status or comments for that item. 9. If needed, select the Adjust Inventory button to remove the item from your store's inventory. 1. 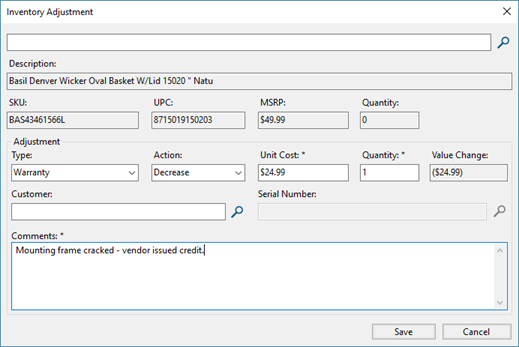 Select Create > Inventory Adjustment from the Ascend desktop. 2. Use the search bar at the top of the window to find the item. 3. If needed, select the item from the search results. 4. In the Type drop-down menu, select Warranty. 5. In the Action drop-down menu, select Decrease. 6. Verify the cost in the Unit Cost field. 7. Update the Quantity field. 8. If the item is serialized, fill out the Serial Number field. 9. Enter a description of the warranty issue in the Comments field. 10. Click Save to remove the product from inventory. Inventory Adjustments can be viewed at any time be selecting View > Inventory Adjustments from the Ascend desktop.